OK. Deep breaths. This is only the second day of this glorious NCAA Tournament, but it's already becoming one of the most memorable in the annals of hoops history. And, wouldn't you know it, Spokane was a major part of it. As I told you earlier today, Hawaii stunned California in the opener at the Spokane Arena — a 13 seed beating a 4 seed — and on most opening week Fridays, that would be a national headline. But just a half hour later, Michigan State fell to Middle Tennessee State (15 over 2). Then Stephen F. Austin manhandled West Virginia (14 over 3). And then things would continue to get crazy. But at the Spokane Arena, Maryland was taking care of South Dakota State, leading by 18 points in the second half thanks to 27 points from senior forward Jake Layman. It seemed like a break from the madness. But then SDSU came crawling, and the sprinting, back into the game. The Jackrabbits got the game within two points with a minute left. Because of a weird series of fouls and missed free throws, SDSU actually had the ball with 12 seconds left down by just three. But...they turned it over on the last possession – leading to a breakaway dunk by former Duke, current Maryland guard Rasheed Sulaimon to jack the Rabbits' chance at an upset. 79-74, Maryland. Next up came Oregon and their day-glo fans, which you've probably seen all over town. On a day during which it felt like anything could happen, it never felt like Holy Cross could do much harm to Oregon. That’s not to discredit Holy Cross, a school that entered its conference tournament as the nine seed and proceeded to run the table. 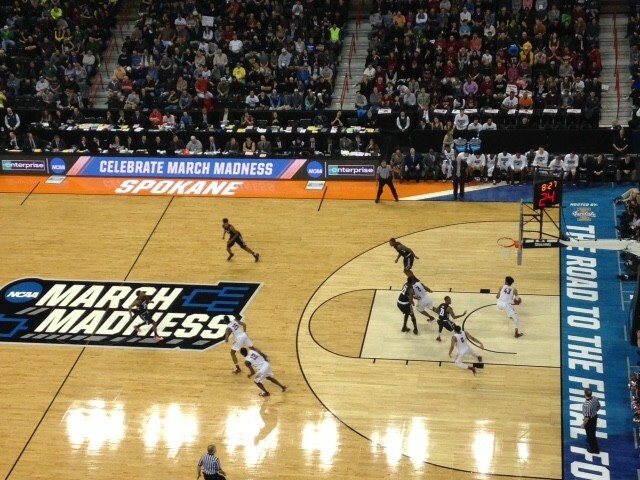 Then, they squeezed out a win over Southern in the first four just to get to Spokane. The Ducks' Chris Boucher delivered three alley-oop dunks within the span of about four minutes and that kind of knocked the Crusaders out of things. Oregon is tough and big and fast. We learned that today. Oregon dismantled those kids from Holy Cross and it didn't look like the Ducks were ever really sweating it. 91-52, Oregon. The nightcap, though, was a different story. It was one of the most evenly matched games of the tournament thus far. In a word, it was a slugfest, man. It was Rocky II. I could lay out the back-and-forth nature of the contest, but you should just know that St. Joseph's and Cincinnati played a gem.